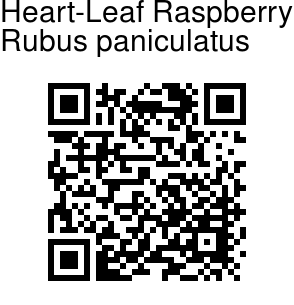 Heart-Leaf Raspberry is a rambling climber, distinguished by its large ovate-heart-shaped, finely toothed leaves. Also prominent are branched clusters of white flowers at the end of branches. Flowers are 1-1.5 cm across. They have narrow petals which are much shorter than the pale silky- haired sepals. Leaves are 8-15 cm long, including the 2-3 cm long leaf-stalk. 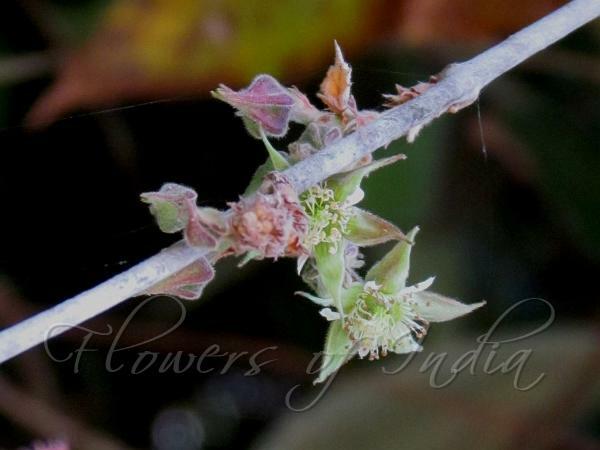 All parts of the plant, except the upper surface of the leaves are covered with white or buff hairs. Thorns are absent or few. Fruit is about 1 cm, edible, with many glossy black carpels. Heart-Leaf Raspberry is found in the Himalayas, from Pakistan to Bhutan, at altitudes of 1500-2900 m. Flowering: June-August.